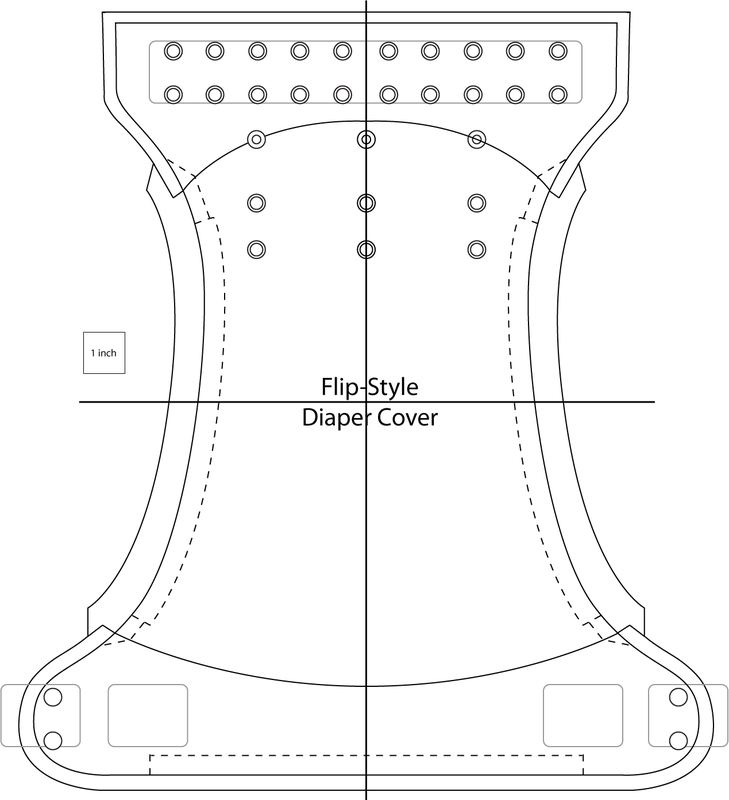 This was made by request of one of my blog followers to be similar to the Flip system diaper covers by Cotton Babies. However, it doesn't use the trim casing that they use or the stretchy tabs. You can download/print it HERE. There is a NB/S version now as well. Cut out all your PUL pieces (including snap-backing). Apply your rise and front panel snaps (or rise snaps and front loop strip for hook and loop). Fold in the edge along the leg elastic areas and sew your casings (I use 3/8", but CB uses 1/4"). Lay out your tucking pocket pieces face to face with the laminated sides out. Trim up your edges and turn the pockets. Sew your back elastic casing. Install your elastics (the casings are all open and easy to thread through). Stretch to desired tension and tack+trim. Now just apply your wing snaps. By popular demand, I have added a tutorial and template for a Newborn-Small version as well. This is incredible timing. I've been searching high and low for something just like this. Thank you so very much for taking the time to make this. A few questions if you have the time. I'd like to add a lining - do you have any recommendations as to how I could incorporate that? Also, I think I understand how you installed the soaker- can you give any more information about how you made the soaker, what size, etc. Thanks again for an awesome blog and for your help. The word "SOAKER" above is the link to the soaker template. I used 2 layers of heavy bamboo fleece per segment. The one main long piece, and the short middle piece behind it. You could use any absorbent material though. For jersey, I'd say 4 layers per insert segment. So, the long one being 4 layers, and then the shorter one 3-4. The way the new elementals are, you can just slide a separate insert of any type behind them for bigger babies and heavier wetters too. Nice! Your template/tutorial looks a whole lot easier than the flip-style tutorial I fumbled my way through a few weeks ago. Thank you very much for sharing! Did you finish the leg edge in any way before turning it under for the leg elastic? Thanks for the template! Nope. I just sew it down when I am sewing the casings. I use a straight stitch about 1/8 inch in from the edge of the fabric. Sorry for all the questions. What kind of elastic are you using? Also, what is your reason for using 3/8 instead of 1/4" elastic? I use Stretchrite polybraid. My reason for the 3/8" is because that is what I always use and thus hand on-hand. I personally prefer how it stretches and holds up in general. I only occasionally use 1/4" and only for newborn diapers if I do. Did you just put an extra rectangle of PUL for the OS snap area? I think I'm going to try this pattern out. :) Thanks for the tutorial. Thank you so much! I'm glad I asked instead of just assuming. :) I can see what you did now. Your way you have the full flaps to tuck an insert under. I would've put all the snaps all the way through the front flap without even noticing yours was different. Another question: Is this flip style (as in your pattern but made with the flaps like Flips?) or is it actually similar/the same as the Flip pattern? Thanks. Flips use a binding-encased elastic around them like the Econobums do. This uses the body PUL just folded in. I tried to make the general shape and dimensions similar to Flips so that people who like the fit of them could try and make these as an acceptable replacement for themselves. They are for sure not exactly the same, but should produce a similar fit. I am having a little trouble getting the leg casings nice and flat, is there a trick to getting them to not bunch up and have the fabric overlap? I just go really slowly and guide it carefully with my hand while stretching the PUL a bit to the shape I want. It DOES bunch a little. Just keep in-mind that once the elastic is in and stretched, that won't be an issue whatsoever. :) Look at my photos, and you'll see that it does bunch and twist some. I am trying to find a simple patter for an all in 2 since I haven't made one yet, but from my understanding its like a cover with snaps to snap in a liner? Would this pattern work well for this and if so do you have a recommendation for where to place the snaps? Thank you, very much, for sharing this pattern & tutorial. What length do you cut the elastic, both for the legs & the back? I never pre-measure my elastics. I tack one end, then stretch to the desired tension. Then sew down the other end. Then cut and top-stitch. I don't have snaps so I always use aplix Velcro, how would I do the front? You'd do the front panel the normal way, but you wouldn't be able to use the snap-down rise to make it on-size. It would just be a large. Or you could keep your elastic casings open and do adjustable elastic or something to make them OS. Sorry to repeat a question, I didn't quite understand the response. Mama Samweli asked if you used a rectangle shape of PUL for the snaps, and your response was it is a partial height cut..In the picture there is only the main diaper body, and the front and back flaps. Does that mean that you just snap through one layer of PUL? Thanks! Look more closely at the photos. ;) They are the same color, but you'll see the shorter piece, if you look closely. You can click on them to see them larger and then click through the whole series that way. What is the seam allowance for the pattern? I swear I must be missing it! :) This is an amazing help for me, though, I'm so glad I found it! There is no seam allowance. All of my templates are cutting templates and include it, if it is needed. Approximately how many diaper covers can you get per yard of PUL? It depends on the width, but only 3-4 with this template. You'll get better production per yard when you work with more yardage though. Less wasted with scraps etc. when you work from 3+ yards. Very impressive!!! Just finishing my first CD (a little green bear tuckable) and am stoked to give it another go! Most of our stash is BG and I love covers so I'm excited to try your Flip pattern. It is SO good of you to share your resources! Thank you! This is AAAaammMMMmAzing!! Do you think a prefold could be stuffed in there vs. an insert? How do you place the snaps or how do you fold it to get to the smallest size? Also I, too, would like to know if a prefold would work for this? Can gussets be added to this ?! If so, how do you suggest going about that? Awesome! Thanks for the tute! Just finished the first of many! Question do you have a soaker pattern and liner patterns? To go with this second how many diapers can u make per yard and roughly with how much extra fabric? Th soaker template is on the downloads page along with everything else. How many cuts you can get and how many you use per diaper all depends on what fabric you're using. I did mine with 2 petals that were 2 layers of heavy bamboo, cotton, or hemp fleece each. I have also done them with 1 petal that was 2 bamboo fleece and 1 bamboo velour, and the back petal of 1 layer each of bamboo fleece and hemp fleece. If you are using cotton interlock or something different, then your layering, absorbency, etc. will all be different. Can I buy the diaper cut out fabric or do I need a yard? 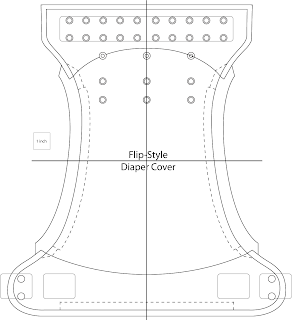 A typical diaper cut will be enough for the main body and snap-backings, but you would need other cuts for the inside pieces that make the pockets/flaps at the top and bottom. You could use scraps of other PUL as long as the stretch is left to right and not top to bottom. Hi there! Making my first diaper and all was going well until I got to the back elastic...would you be able to elaborate more on how to sew it in? It seems different then the legs. Thanks! You install it like my "installing cased elastic" tutorial shows. Just feed it from inside the little back pocket/flap after sewing the casing channel. I would never sew cotton onto PUL with a fold-in casing, as the cotton is right against the inside, and no matter what needle or thread you use or how you seal, the cotton will wick because it is inside against the skin. However, the only time I'd ever personally consider using cotton with a cover is if it is a basic T&T cover with PUL only on the inside and the cotton only on the outside. Do you have a pictorial for the soaker/insert? for people who have made these... I'm in the process of making many but wanted to know... how did these hold up for you? Did you add gussets? Any leaks? I definitely add gussets as my heavy wetter leaks through without them. Though I've heard a lot of different opinions that adding gussets just adds too much bulk in the crotch area for them and ends up being too constricting. I'd try both and see what works for you. Hi! Love this tutorial! is there another anywhere that has the 4.0's fit? for example the pocket style that you stuff? I just wanted to say thank you very much for posting this free pattern and tutorial. I recently made my first one and used it on my 5-month-old--it worked great! It was easy to use like the store-bought version and contained the #2 mess really well. I have already cut more to make. Awesome pattern, thank you! How long do you cut your elastics to in the leg and back casings? I know you don't pre-measure the elastics as they're all different tensions, but what length should the leg holes rest at? Ooooo neat question. I will go measure as soon as I have a chance. Is there a reason there is one extra piece in the newborn/small version compared to this one? Hi , I am very new to CD world , can you please tell me from what age to what age the first pattern can be useful?